Esi Edugyan has been named the winner of the $100,000 Scotiabank Giller Prize for her novel Washington Black, published by Patrick Crean Editions. The announcement was made this evening at a black-tie dinner and award ceremony hosted by Canadian comedian, television personality and author Rick Mercer and attended by nearly 500 members of the publishing, media and arts communities. The gala was broadcast and streamed live on CBC, the CBC streaming app, CBC Radio One and CBCBooks.ca. The longlist, shortlist, and winner were selected by an esteemed five-member jury panel: Canadian writers Kamal Al-Solaylee (Jury Chair), Maxine Bailey and Heather O’Neill along with American writer John Freeman and English novelist Philip Hensher. Esi Edugyan won the Scotiabank Giller Prize in 2011 for her novel Half-Blood Blues. The novel was a finalist for the Man Booker Prize, the Governor General’s Literary Award for Fiction, the Rogers Writers’ Trust Fiction Prize and the Orange Prize for Fiction. The author lives in Victoria, BC. Listen to CBC Radio’s q tomorrow at 10 a.m. 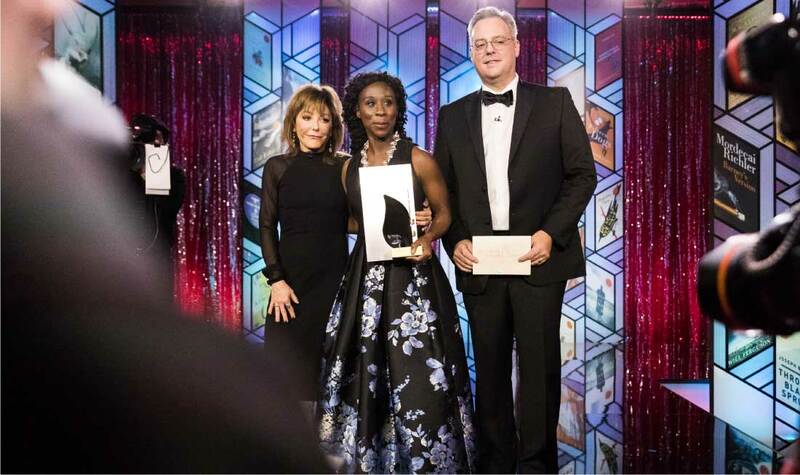 ET for an interview with Esi Edugyan and relive the gala on the CBC streaming app and at CBCBooks.ca. Ask the author your questions about her book during a live Twitter chat hosted by @GillerPrize on November 22 at 2:00 p.m. ET using the hashtag #GillerWinner. Images from tonight’s gala will be available on the media resources page. Audible, the world’s largest creator and distributor of audiobooks, is committed to supporting talented Canadian authors and narrators and is proud to be the exclusive audiobook sponsor of the Scotiabank Giller Prize. The winner of the Scotiabank Giller Prize will be given an opportunity to explore, expand, and develop their practice during a two-week, self-directed residency in Banff Centre for Arts and Creativity’s exclusive Leighton Artists’ Studios. Located on Treaty 7 territory in Banff National Park, Banff Centre is Canada’s largest post graduate arts and leadership training institute (banffcentre.ca). Cineplex is a proud sponsor of the Scotiabank Giller Prize and its support of excellence in Canadian literary talent. The Giller Prize, founded by Jack Rabinovitch in 1994, highlights the very best in Canadian fiction year after year. In 2005, the prize teamed up with Scotiabank who increased the winnings 4-fold. The Scotiabank Giller Prize now awards $100,000 annually to the author of the best Canadian novel or short story collection published in English, and $10,000 to each of the finalists. The award is named in honour of the late literary journalist Doris Giller by her husband Toronto businessman Jack Rabinovitch, who passed away in August 2017. Audible, Inc., an Amazon.com, Inc. subsidiary (NASDAQ: AMZN), is the leading provider of premium digital spoken audio content, offering customers a new way to enhance and enrich their lives every day. Audible was created to unleash the emotive music in language and the habituating power and utility of verbal expression. Audible content includes more than 375,000 audio programs from leading audiobook publishers, broadcasters, entertainers, magazine and newspaper publishers, and business information providers. A leading entertainment and media company, Cineplex (TSX:CGX) is a top-tier Canadian brand that operates in the Film Entertainment and Content, Amusement and Leisure, and Media sectors. As Canada’s largest and most innovative film exhibitor, Cineplex welcomes over 70 million guests annually through its circuit of 164 theatres across the country. Cineplex also operates successful businesses in digital commerce (CineplexStore.com), food service, alternative programming (Cineplex Events), cinema media (Cineplex Media), digital place-based media (Cineplex Digital Media), amusement solutions (Player One Amusement Group) and an online eSports platform for competitive and passionate gamers (WorldGaming.com). Additionally, Cineplex operates a location based entertainment business through Canada’s newest destination for ‘Eats & Entertainment’ (The Rec Room), and will also be opening new complexes specially designed for teens and families (Playdium) as well as exciting new sports and entertainment venues across Canada (Topgolf). Cineplex is a joint venture partner in SCENE, Canada’s largest entertainment loyalty program. Founded in 1933, Banff Centre for Arts and Creativity is a learning organization built upon an extraordinary legacy of excellence in artistic and creative development. What started as a single course in drama has grown to become the global organization leading in arts, culture, and creativity across dozens of disciplines. From our home in the stunning Canadian Rocky Mountains, Banff Centre for Arts and Creativity aims to inspire everyone who attends our campus – artists, leaders, and thinkers – to unleash their creative potential and realize their unique contribution to society through cross-disciplinary learning opportunities, world-class performances, and public outreach.